Bijan Kian enters the FBI Washington Field Office in Washington, Dec. 17, 2018. The United States is accusing two former business associates of one-time Trump national security adviser Michael Flynn of illegally carrying out a Turkish lobbying campaign in the United States. The indictments against Bijan Kian, a 66-year-old American, and Ekim Alptekin, a 41-year-old Turk, were unsealed Monday in a courtroom in Alexandria, Virginia, just outside Washington. The two men were charged with conspiring to violate U.S. lobbying laws, with Alptekin also accused of lying to federal investigators. FILE - Former Trump national security adviser Michael Flynn leaves federal court in Washington, Dec. 1, 2017. The U.S. alleged the men worked with Flynn, whom President Donald Trump named as his first national security chief in 2017 before firing him in less than a month. The United States said Kian and Alptekin conspired to "covertly influence U.S. politicians and public opinion" against Muslim cleric, Fethullah Gulen, whom Turkish President Recep Tayyip Erdogan has accused of orchestrating the failed 2016 coup against him from across the Atlantic while living in self-imposed exile in the United States. Flynn was paid $500,000 to lobby for Turkey in the months before briefly working in Trump's White House. The indictment alleged the purpose of the campaign funded by the Turkish government was to disparage Gulen in the eyes of the American public, with the goal of pushing the U.S. government to meet Erdogan's demand he be extradited to Ankara. Erdogan has long sought Gulen's return to his homeland to face charges he oversaw the military uprising against him that left 300 people dead, even as Erdogan's troops eventually prevailed. But U.S. officials have refused, saying Turkey has not provided evidence of Gulen's complicity. Gulen has rejected the claims. FILE - Turkey's Foreign Minister Mevlut Cavusoglu, listens to a reporter's question during a joint news conference with Russia's Foreign Minister Sergey Lavrov (not pictured), in Ankara, Turkey, Aug. 14, 2018. On Sunday, Turkish Foreign Minister Mevlut Cavusoglu told the U.S. television network CNBC that when Trump and Erdogan recently met at the G-20 summit in Argentina, the American leader said the United States is "working on extraditing" Gulen "and other people." The charges against Kian and Alptekin came a day before Flynn's sentencing for lying to federal investigators about his contacts with Russia's then-ambassador to Washington in the weeks before Trump assumed power in January 2017. 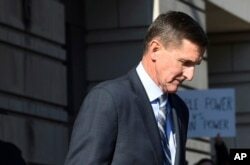 Prosecutors with special counsel Robert Mueller's office have asked for leniency for Flynn, saying he provided them "substantial help" in several investigations, including apparently in the case against his two former business associates in the Turkey probe. If convicted, Kian faces a maximum penalty of five years in prison on the conspiracy charge, and 10 years in prison for the charge of acting as an agent of a foreign government. Alptekin, if convicted, faces up to five years in prison for the conspiracy charge, 10 years in prison for the charge of acting as an agent of a foreign government, and five years on each of four false statement charges.